ww2dbaseIvan Khristoforovich Bagramyan was born in Chardakhlu, an ethnically Armenian village then ruled by the Russian Empire and today a part of Azerbaijan, to railroad station worker Khachatur and homemaker Mariam Bagramyan. He attended a school at Yelizavetpol (now Ganja, Azerbaijan) between 1910 and 1912, then moved on to a railway technical school in Tiflis, Russia (now Tbilisi, Georgia). During WW1, although as a railroad engineer he was not subjected to the draft, he volunteered for military service in Sep 1915 and was assigned to the 116th Reserve Battalion. He received basic training Akhaltsikhe in present-day Georgia before being assigned to the Second Caucasus Frontier Regiment in Jan 1916. He saw action in Asadabad, Hamedan, and Kermanshah in Persia against Ottoman forces. Between Feb and Jun 1917, he attended the Praporshchik Military Academy in Tiflis. He briefly served with the Third Armenian Infantry regiment stationed near Lake Urmia in present-day Iran before the regiment was disbanded due to the overthrow of the Russian Empire. In 1918, he joined the army of the newly established Democratic Republic of Armenia. In May 1920, he participated in a failed attempt to overthrow the Armenian republic and was sentenced to hard labor; he was freed months later, however, as the country needed soldiers during the Turkish-Armenian War. In Dec 1920, as Armenia transformed into a Soviet republic, he became a cavalry regimental commander in the Soviet 11th Army. In late 1922, he married widow Tamara Hamayakovna, whose first husband had been killed during the Turkish-Armenian War; Hamayakovna had a son, Movses, with her first husband and Bagramyan and Hamayakovna had a daughter, Margarit. Between 1923 and 1931, he was the commanding officer of the Alexandropol Cavalry Regiment. In 1933, he graduated from the Leningrad Cavalry School in northern Russia. In 1934, he graduated from the Frunze Military Academy in Moscow, Russia; he was nearly expelled from Frunze due to his involvement with Armenian nationalist movements. Between 1934 and 1936, he was the chief of staff of the 5th Cavalry Division. Between 1938 and 1940, he was an instructor with the Military Academy of the Soviet General Staff. He did not join the Communist Party until 1941.
ww2dbaseIn 1940, Bagramyan's acquaintance Georgy Zhukov was named the commanding officer of the Kiev Military District in Ukraine; Bagramyan wrote to Zhukov asking to be transferred under his command, and Zhukov agreed. While under Zhukov, Bagramyan authored the paper Conducting a Contemporary Offensive Operation, which led to his promotion to lead the operations department of the Soviet 12th Army at the rank of colonel. Shortly before the German invasion of the Soviet Union in Jun 1941, he was serving as the deputy chief of staff of the Southwestern Front in Kiev. On 22 Jun, the opening day of the Soviet-German war, he was traveling toward Ternopol, Ukraine, and his convoy was strafed twice by German aircraft. He attempted to launch a counter-offensive on 24 Jun, but it was foiled largely by the disorganization of troops under his command. After seeing actions defending Kiev, he was promoted to be Semyon Timoshenko's chief of staff. He was command of the defenses near Rostov in southern Russia, and was praised by political officer Nikita Khrushchev. In the winter of 1941 to 1942, he played a part in the successful defense of Moscow, Russia. Promoted to the rank of lieutenant general, he was made the chief of staff of a military operations group in charge of overseeing the Southern Front, the Southwestern Front, and the Bryansk Front. In Mar 1942, together with Timoshenko and Khrushchev, he presented a plan to advance toward Kharkov, Ukraine, which was accepted, resulting in the disastrous Second Battle of Kharkov in which saw the destruction of about 18 to 20 Soviet divisions; he was relieved of his chief of staff position with the Southwestern Front by STAVKA on 28 Jun 1942 for this defeat and was relegated to be the chief of staff of the Soviet 28th Army. In the following month, however, Zhukov came to his rescue and secured him at the helm of the Soviet 16th Army, although he did not see major action for the subsequent year. In the summer of 1943, as the commanding officer of the 15-divisions-strong 11th Army, he played a key role in the planning of Operation Kutuzov, which was to be launched on 12 Jul 1943 during the Battle of Kursk, and the success of which earned him a promotion to the rank of colonel general. In Oct 1943, his 11th Army was transferred to the Second Baltic Front operating in Byelorussia and the Baltic states. In Nov 1943, he was named the commanding officer of the First Baltic Front. 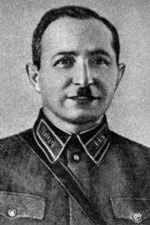 As Joseph Stalin personally allowed him to transfer his favorite formation, the 11th Army now under the command of Colonel General N. E. Chibisov, to his new command, Bagramyan hinted that it would be difficult to command Chibisov as they shared the same rank; sensing the hint, Stalin granted Bagramyan a promotion to the rank of General of the Army. With the First Baltic Front, he continued his campaign in Byelorussia and saw the capture of Gorodok in Vitebsk Oblast, among other locales. In the summer of 1944, still at the helm of First Baltic Front, he participated in the Operation Bagration offensive, with his troops capturing Polatsk, Byelorussia by 3 Jul 1944, destroying the German Third Panzer Army in the process. On 7 Jul, he was made a Hero of the Soviet Union. As the First Baltic Front advanced into the Baltic States, he was successful in preventing the German Army Group North from falling back to East Prussia. In Apr 1945, his front captured Königsberg in East Prussia. On 9 May 1945, he accepted the surrender of German forces in Latvia. ww2dbaseBagramyan held the distinction of being the first ethnic Armenian to command a Soviet front during WW2. ww2dbaseAfter the war, Bagramyan became the commanding officer of the Soviet Baltic Military District, where he conducted campaigns against Lithuanian and Latvian partisans. In 1952, he became a candidate for entry into the Central Committee. In 1954, he was made the Chief Inspector of the Ministry of Defense. 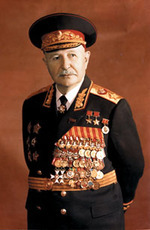 In 1955, he was made Deputy Minister of Defense at the rank of Marshal of the Soviet Union. In 1961, he was made a member of the Central Committee. In Aug 1967, he visited North Vietnam. He retired from military service in 1968. He passed away in 1982 and was buried at the Kremlin Wall Necropolis in Moscow, Russia. 2 Dec 1897 Ivan Bagramyan was born in Chardakhlu, Russia; his birth date was recorded as 20 Nov 1897 in the Russian Old Style calendar. 16 Sep 1915 Ivan Bagramyan volunteered for the Russian Army. 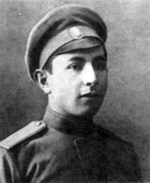 13 Feb 1917 Ivan Bagramyan enrolled at the Praporshchik Military Academy in Tiflis, Russia (now Tblisi, Georgia). 24 Jun 1941 Ivan Bagramyan attempted to launch a counterattack against German advances in Ukraine, but it would fail to achieve much due to the unprepared state of his troops. 6 Nov 1941 Ivan Bagramyan was awarded the Order of the Red Banner for the first time. 8 Apr 1942 Ivan Bagramyan was named the chief of staff of the Southwestern Front. 28 Jun 1942 The STAVKA relieved Ivan Bagramyan as the chief of staff of the Southwestern Front after the defeat in the Second Battle of Kharkov in Ukraine. 9 Apr 1943 Ivan Bagramyan was awarded the Order of Kutuzov 1st Class. 27 Aug 1943 Ivan Bagramyan was awarded the Order of Suvorov for the first time. 7 Jul 1944 Ivan Bagramyan was made a Hero of the Soviet Union for the first time. 29 Jul 1944 Ivan Bagramyan was awarded the Order of Lenin for the first time. 30 Nov 1944 Ivan Bagramyan was awarded the Order of the Red Banner for the second time. 19 Apr 1945 Ivan Bagramyan was awarded the Order of Suvorov for the second time. 6 Nov 1945 Ivan Bagramyan was awarded the Order of Lenin for the second time. 2 Dec 1947 Ivan Bagramyan was awarded the Order of Lenin for the third time. 17 May 1951 Ivan Bagramyan was awarded the Order of the Red Banner for the third time. 2 Dec 1957 Ivan Bagramyan was awarded the Order of Lenin for the fourth time. 1 Dec 1967 Ivan Bagramyan was awarded the Order of Lenin for the fifth time. 22 Feb 1968 Ivan Bagramyan was awarded the Order of the October Revolution and was awarded the gold National Emblem of the Soviet Union to his personal arms. 1 Dec 1972 Ivan Bagramyan was awarded the Order of Lenin for the sixth time. 30 Apr 1975 Ivan Bagramyan was awarded the Order for Service to the Homeland in the Armed Forces of the USSR 3rd Class. 1 Dec 1977 Ivan Bagramyan was made a Hero of the Soviet Union for the second time and was awarded the Order of Lenin for the seventh time. 21 Sep 1982 Ivan Bagramyan passed away in Moscow, Russia.